There’s only one way to put this… When cupcakes enter our house, they just don’t stand a chance. If you want to have more than one, you better get while the gettin’s good because Mike is a huge fan of cupcakes. Generally, he likes to keep things simple. A good chocolate cake topped with vanilla frosting is the way he likes his cupcakes. Nothing fancy and he’s happy as can be. So wasn’t in for a surprise when I bounced the idea of a coconut lime cupcake off him and he was all for it? If you like coconut then you’ve come to the right place. 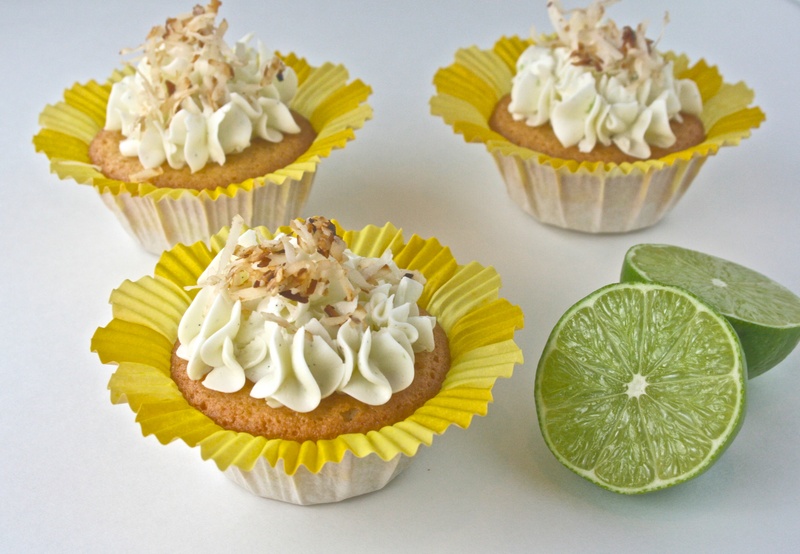 When coconut milk joins vanilla beans the results are heavenly and then a lime-zested frosting gives these cupcakes a very tropical feel. The nice thing about these cupcakes is that even though there’s coconut in each component, it’s pleasantly not overpowering. I also like that the frosting was not heavy or overly sugary. It’s more like a whipped cream frosting than a buttercream. Even though Mike was open to the idea of a cupcake outside his norm, that didn’t mean that he would actually end up eating it. This remained to be seen. With a family dinner at my father’s house upon us, I set about baking cupcakes for the occasion hoping they would be a hit. I carefully frosted them and garnished them with some toasted coconut then nestled them all neatly in a box. After a scrumptious dinner prepared by my dad, it was time for the great reveal. I opened the box and I found myself puzzled, a look of confusion surely swept over my face. For some reason the cupcakes didn’t look all neatly nestled anymore. It wasn’t that they were squished or damaged during their trek to my father’s house. It took me a moment… I pondered because I couldn’t immediately figure out what was going on. Then it hit me! I looked up at Mike and said “How many did you eat? ?” He smirked and sheepishly reported “3.” This is what I’m talking about. If there are cupcakes in the vacinity, you absolutely must keep a close eye on them otherwise throughout the afternoon their numbers will magically dwindle. Needless to say, Mike loved the cupcakes as did everyone else in attendance. This is a perfect summery cupcake that I’m sure you’ll likely devour as well. *Included are conversions for the use of vanilla extract instead of vanilla bean but I assure you, using vanilla beans really add something special to the flavor of this cupcake. 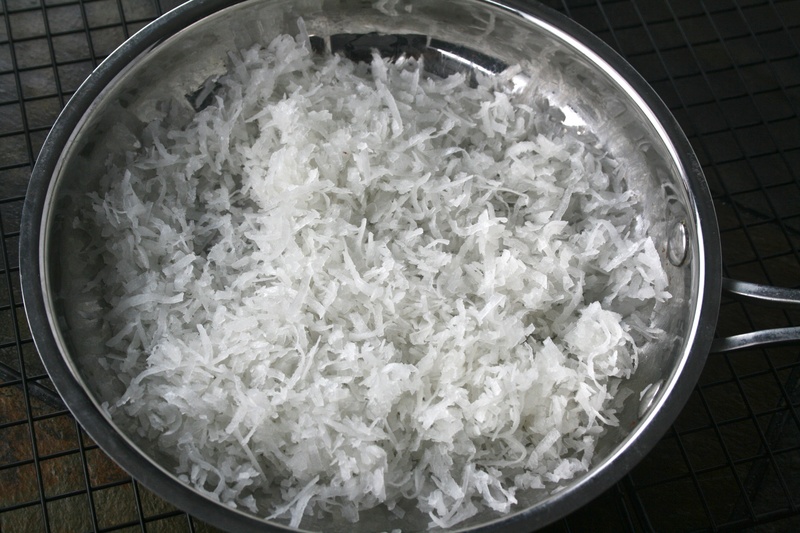 – Bring coconut milk to boil in large deep saucepan over medium-high heat (coconut milk will boil up high in pan). Reduce heat to medium-low; boil until reduced to 1 1/2 cups, stirring occasionally, 25 to 30 minutes. Remove from heat; cool completely. Transfer to small bowl. Cover; chill (coconut milk will settle slightly as it cools). – Position rack in center of oven; preheat to 350°F. 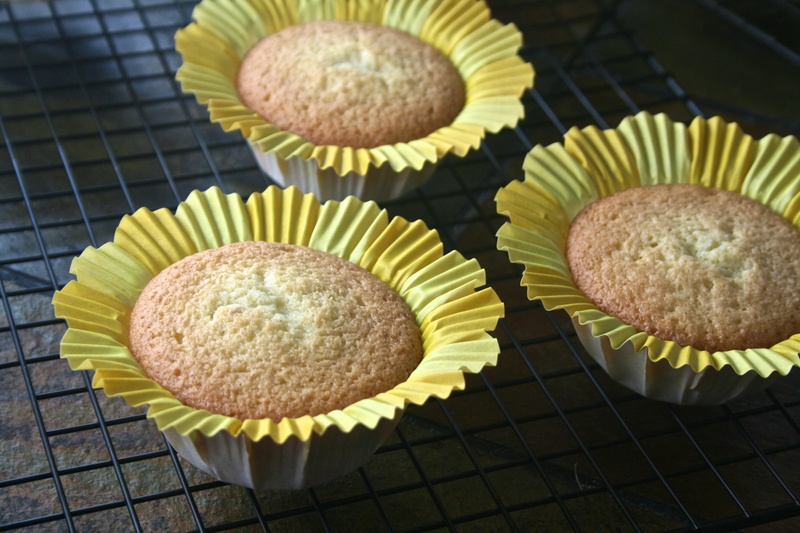 – Line eighteen 1/3-cup muffin cups with paper liners. 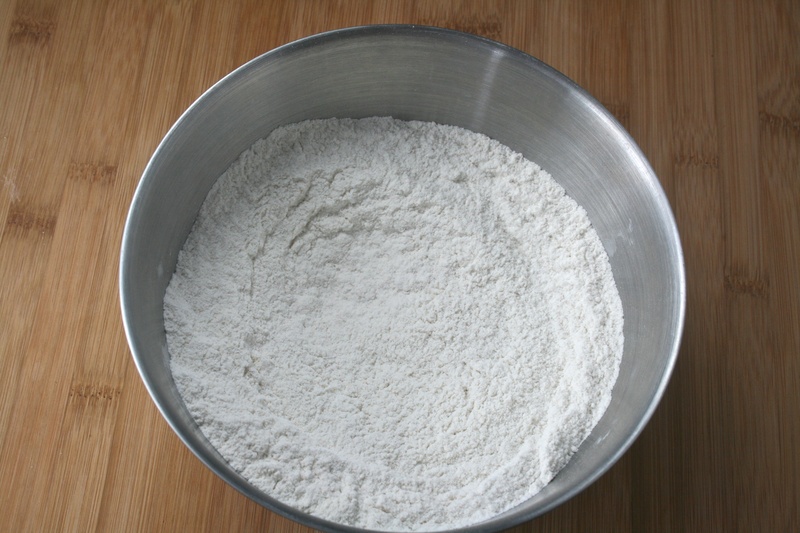 – Whisk flour, baking powder, and salt in medium bowl. 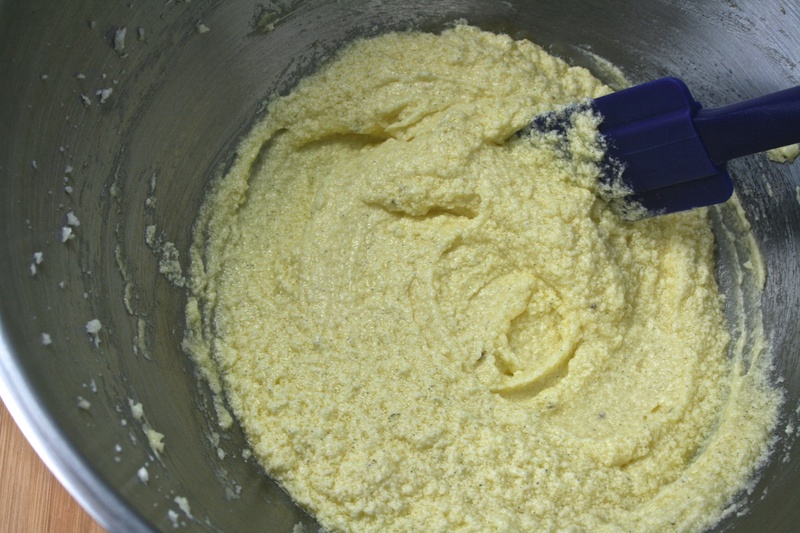 – Using electric mixer, beat butter in large bowl until smooth. – Add sugar; beat on medium-high speed until well blended, about 2 minutes. 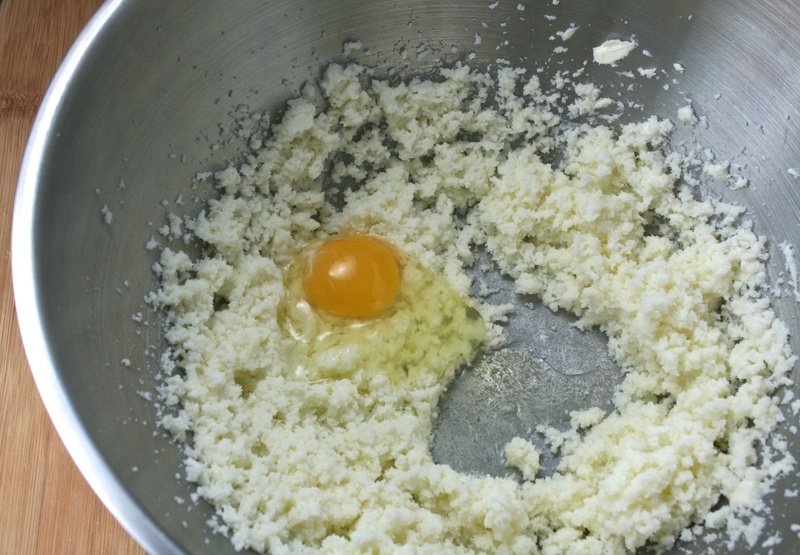 Add eggs, 1 at a time, beating well after each addition and occasionally scraping down sides of bowl. – Beat in seeds from vanilla bean with the addition of the last egg. 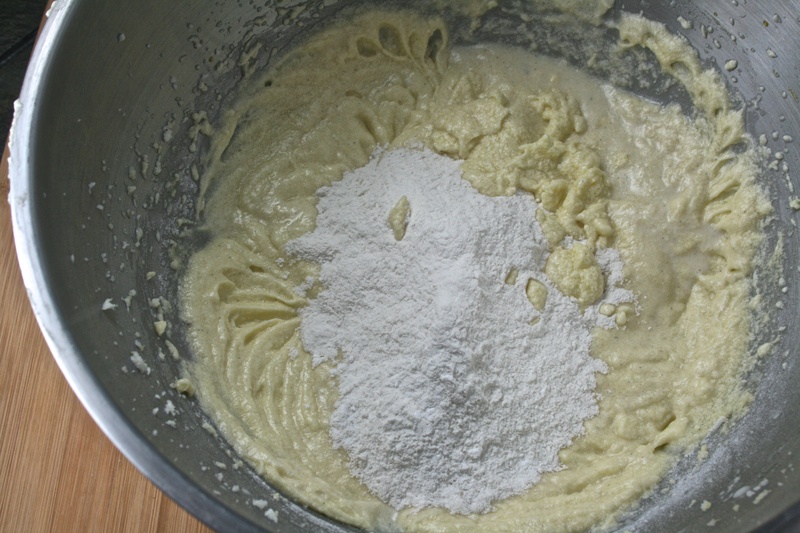 – Add half of flour mixture; mix on low speed just until blended. Add 1 cup reduced coconut milk; mix just until blended. Add remaining flour mixture; mix on low speed just until blended. – Divide batter among muffin cups. – Bake cupcakes until tops spring back when gently touched and tester inserted into center comes out clean, about 20 minutes. 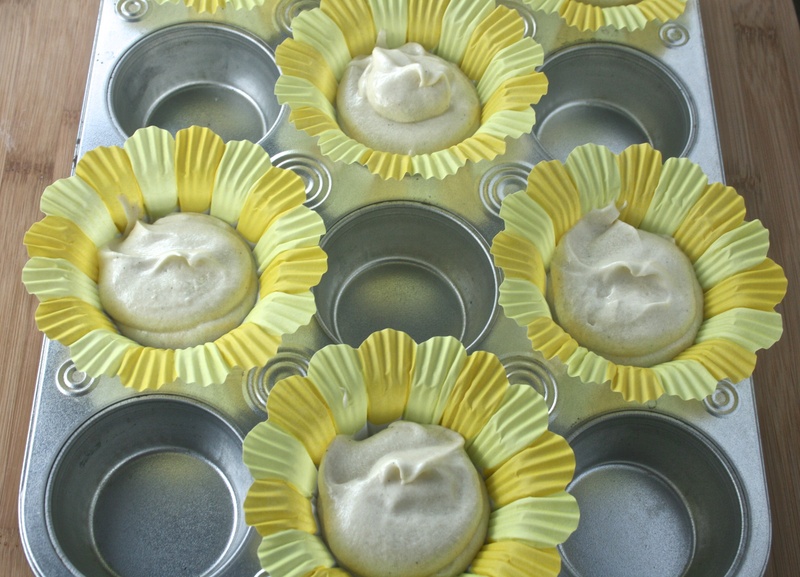 – Transfer cupcakes in pans to rack; cool 10 minutes. Carefully remove cupcakes from pans and cool completely on rack. 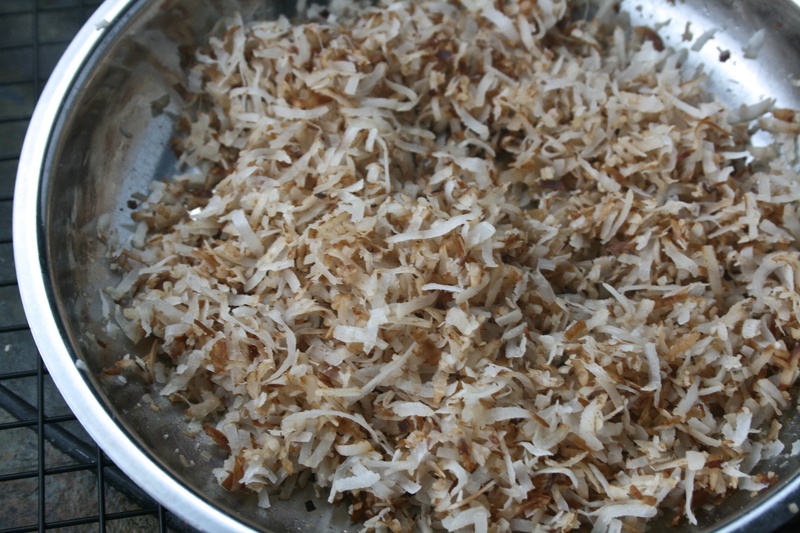 – Spread sweetened flaked coconut on a baking sheet and bake at 350 degrees for 6-8 minutes, stirring frequently until lightly toasted and fragrant. – Using electric mixer, beat butter in large bowl until smooth. Add sugar, 1/3 cup reduced coconut milk, seeds from vanilla bean, salt, lime zest, and lime juice. Beat on medium-low speed until blended, scraping down sides of bowl. Increase to medium-high and beat until light and fluffy. 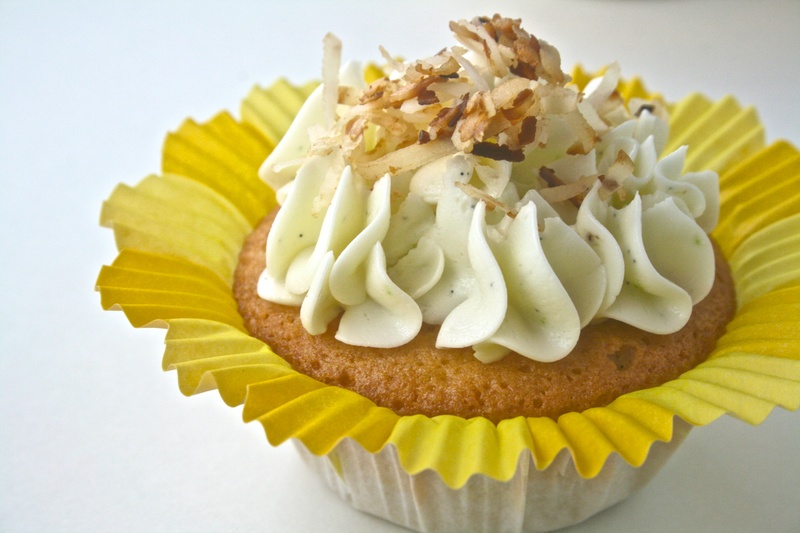 – Frost your cupcakes with about 2 tablespoons of frosting and sprinkle with toasted coconut. Chill. Bring to room temperature before serving. Those cupcake liners are adorable! Sounds like these wouldn’t be safe in my house either–LOVE coconut. Bet they are delicious! Those cupcake liners were a “must buy!” Too cute to pass up. And yes, so delicious! Absolutely gorgeous!! And they sound delicious as well! Oh that looks and sounds beautiful! I love coconut, I just baked coconut bread a few days ago. Will definitely try this. Ooo!! Coconut bread sounds fantastic! Thanks for your comment. 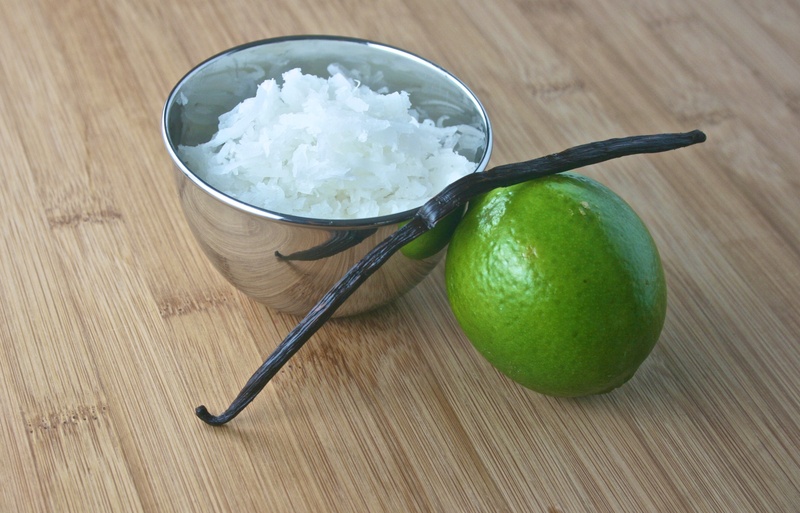 Coconut and lime are a new favorite of mine after an attempt at making a key lime pie coupled with only having a can of coconut milk came together in a brand new favorite. Love these and I agree…great liners! Delightful cupcakes! 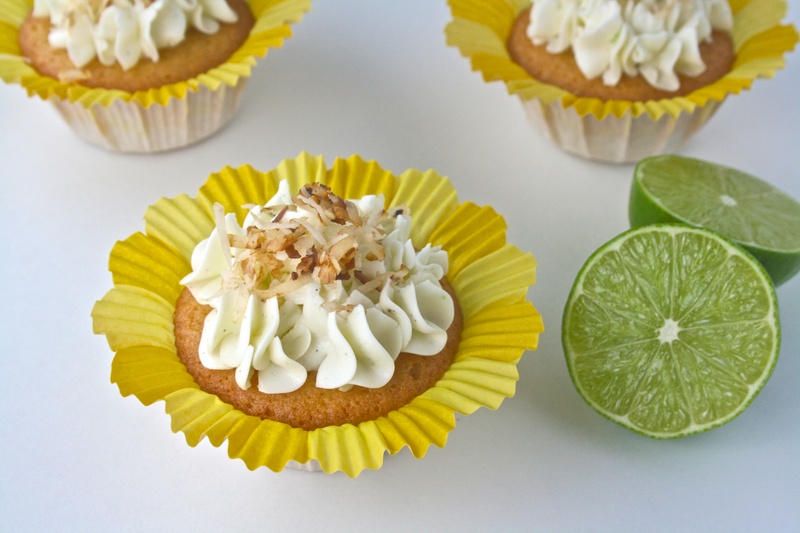 Lime and toasted coconut sounds so enticing. The adorable wrappers are a great compliment to your cupcakes. Looks incredible! What a unique flavor this must have. Can not way to try it. I have a few vanilla beans left from my last order at beanilla.com that will be perfect for this! Thanks again. These look delicious! I don’t think I could have stopped at 3! Thanks!! What a nice comment. Yes, the coconut lime was a fantastic combo indeed!